Priced: $59.37 - $99.00 Rated: - 5 stars out of 5 by 220 reviews. The North Face Osito Jacket for Women Features. The North Face Osito Jacket for Women. The North Face Osito Jacket for Women is a great way to get ready for winter. It's made from durable and soft silken fleece that keeps you warm and is gentle at the same time. A brushed collar feels soft against your skin and prevents chafing. It is a perfect option for layering, and is zip-in compatible with other garments. There are elastic-bound cuffs to prevent heat loss and keep drafts at bay. A hem cinch-cord allows you to adjust the jacket in changing climatic conditions. There are two hand pockets provided to store small gear close by and keep your hands warm. It is lightweight (19.1 oz.) and hence, easy to take along on all your trips, whether you're going camping, hiking or out on the town. For great versatility and constant comfort, try The North Face Osito Jacket for Women. Turn fleece inside to prevent pilling. Machine wash separately in cold water on gentle cycle, using a mild detergent. Do not iron, steam, or dry clean. Also, avoid using bleach or fabric softener. 100% polyester Silken fleece construction. The North Face Osito Jacket gives a new meaning to the word plush. Just try one on and you will see what I mean. Grab yourself a superior soft high loft fleece beanie from The North Face to complete the spectacular winter visage you will make in this incredible jacket. The Osito Jacket by the North Face is the exact jacket you will need for any snowbound vacationing you will do with zip-in compatibility to most TNF outer shells, this jacket will serve you well, and then some. The Osito jacket works layered up for a day of play in the snow or stands alone for an evening out on the town. Straight forward designed with simple lines, not even remotely bulky, but rather soft, warm and comfortable. Constructed of silken fleece with a slim fit to show off those curves, The North Face Osito can be easily paired up with anything else in your wardrobe. The North Face Osito Womens Fleece Jacket is comprised of an incredibly soft, silken fleece. This full zip jacket keeps female explorers warm and comfortable beneath its lavish fabric. Designed to be worn as a causal outer layer in cold weather conditions or a layer under a jacket for the especially cold days, sport the Osito Womens Fleece Jacket on down-time around base camp, shredding the hill or on romps around town. Snuggle up inside the high-loft warmth of this silky fleece jacket. The brushed collar lining is easy on the neck, and durable elastic-bound cuffs with concealable snap closures keep the cold out. This fleece includes two handwarmer pockets, a hem cinch cord keeps out drafts and is zip-in compatible with other The North Face jackets. Sometimes a fleece jacket feels like a thin beach towel. Disappointing. 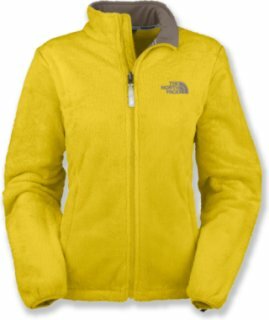 The North Face Women’s Osito Fleece Jacket, however, feels like a high-loft, plush, fuzzy fleece blanket. A standard fit means the Osito slides easily over a tee or long-sleeve thermal top, and the cuff-snaps attach to The North Face Triclimate shells for a day on the slopes. Cozy up in The North Face Osito Jacket. Designed to be worn alone or as a layer in colder conditions, this mid-weight silken fleece women's jacket makes the perfect choice for outdoor or urban adventures. Details of The North Face Osito Jacket include a full-zip front, two hand pockets and elastic bound cuffs. The hem cinchcord secures a comfortable fit. Lose yourself in the layered comfort of the silky smooth North Face Osito Jacket. A soft and gentle fabric swaddles female explorers in it's plush luxury. Designed to be worn as a causal outer layer in cold-weather conditions, The North Face Osito Jacket is great for down-time around base camp, or on romps around town. Stylish and eye-catching, the Osito is ready to satisfy the changing temperate needs of any woman. Snuggle up inside the high-loft warmth of silky fleece with The North Face Women's Osito Jacket. Brushed collar lining is easy on the neck. Durable elastic-bound cuffs with concealable snap closures. Two handwarmer pockets. Hem cinch cord keeps out drafts. Zip-in compatible with other The North Face jackets. Imported. Colors: Ultramarine Blue, Linaria Pink, High Rise Grey, TNF™ Black, TNF™ White, Weimaraner Brown, Brownie Brown, Passion Pink, Greystone Blue, Metallic Silver, Borealis Blue, Moonlight Ivory, Marker Blue, Jaiden Green, Beach Glass Green, Lavendula Purple, Sugary Pink, Azalea Pink, TNF™ Black/Lavendula, Mojito Green. The Women's Osito Jacket by The North Face is durable and comfy with a high loft zip-up fleece that can be zipped into other North Face rain jackets for the ultimate in protection from the winter weather. The North Face Osito Fleece Jacket is the softest fleece you'll ever wear. This silky jacket is incredibly lightweight and also warm, and it's not bulky at all so it feels comfortable over clothes. The Osito Fleece fits really cute. It's relaxed and comfortable, but with a flattering feminine shape. This jacket is also very versatile; in super cold weather it can be zipped into a compatible shell jacket. The North Face Women's Osito Fleece Jacket is a durable zip-up fleece piece that offers extraordinary comfort in its high loft interior. Incredibly soft, warm, and comfortable, The North Face Osito jacket is made of high-loft silken fleece. Fiber Content: 100% polyester fleece. Read the fine print: The North Face Osito Jacket may be mandatory apparel if you've joined a sorority. Seriously, it's a cliché everyone's fully aware of, but can't live without - the basic black TNF fleece full zip. Get one (or a backup) and join the masses. The North Face's Osito flocked jacket looks like fun but means business: wear it by itself or layer it for superior protection from the elements! Soft and silky, The North Face Osito fleece jacket wraps you in warmth and feels like a dream. Wherever you're exploring, keep warm and comfy in this full-zip jacket. with complementing The North Face® shells. Elastic cuffs keep in the warmth. Durable and comfortable raschel, super-soft zip-up fleece perfect for those chilly days. I work in an office that is without heat due to construction. A couple of days ago, I forgot to bring an extra jacket to work with me so I went to REI at lunch to buy one (I was due for a new jacket anyways). I'm typically too cheap to buy North Face or other more expensive brands, but decided to treat myself for my birthday. So far, I couldn't be happier. The jacket is super soft, really warm and quite comfortable. I originally bought a small but exchanged it for a medium the next day as it was too short in the torso and arms. Not North Face's fault, this happens to me all the time. I'm 5'7" and about 130lbs. The medium is overall a little too large, but it'll work for layering. I can't speak to the longevity or overall durability as I just bought the jacket a few days ago. My only complaint is that the zipper does bunch up a bit, especially when I'm sitting. Perhaps this is only because the jacket is a little large for me? Overall, I think it's a fantastic jacket. I bought this because my best friend had one, and every time I saw her wearing it, I would give her really long hugs as an excuse to enjoy it's fabulous fuzziness. Well, said friend now owns it it 4 different colors. From the time mine arrived from REI, I did not want to take it off. I wanted to live (& even occasionally sleep) in it. My daughter keeps trying to steal it from me. Everyone who sees me in it comments on it and then wants one. It has windproof lining in the front to make it warm enough for cool, windy outings, and it's stylish enough to wear outdoors or on the town. It breathes well and is comfortable indoors as well. It has fitted sleeves to keep the chill out, as well as hidden glove/mitten clips. It is well worth the money, as I wear it more than any other piece of clothing I own. My friend has reported that hers have needed to be replaced after a few years due to pilling, but they are still her favorites also, and I have not found this problem yet. I wanted an XL but it was sold out...blah. I decided on the large instead. I'm a tall girl and I was worried about the length of the jacket and the sleeves. The large fits me but the sleeves are about 3 inches too short. I really wish I could exchange this for the XL since it is now available. It can get annoying when you constantly have to pull your sleeves down. It is such a soft jacket and I have received several compliments on it. I love the color. It's in the 20s where I live and it keeps me pretty warm. I would suggest going a size up if you are a tall person. i'm only 5'9" but this jacket makes me feel like an ogre. I really wish the XL would have been available. I absolutely love this jacket! I am from Southern California so I have honestly never really owned a jacket that could keep me warm in cold weather (other than my snowboarding jacket and peacoat, of course!) and this has been such a great investment! My boyfriend and I are avid climbers and hikers and we often are out even the the coldest conditions, and this has been the perfect addition to my camping clothes. I can sleep in it because it is so warm and cozy, and I can hike in it because it moves so easily with me, AND it does a fantastic job of keeping that cold wind out! I am in love with this jacket! This is a great jacket! I would highly recommend it to anyone. It looks exactly as it's pictured on the website, and is so incredibly soft. This jacket is very warm for how lightweight it is. I frequently wear it in 35-55 degree weather and it keeps me warm, usually without needing a thermal underneath. The sleeve length is fine on me, but I could see it being an issue for tall folks. I ordered a small, i'm 115lbs 5'4", and my only complaint is that it's a little big in the shoulders, fits great everywhere else. The toggles at the waist help keep out the cold and give the jacket a really cute, sporty/feminine fit. I brought this for my wife from the Henderson, Nevada store while on a business trip to Las Vegas in June 2013. The store staff were so very helpful, nothing was a bother. The young woman that helped me with this jacket said it was the warmest fleece they had and I was going back to our New Zealand winter so the deal was done. My wife says this really is the warmest jacket next to a puffy down jacket, but this is so much more versatile. Highly recommended if you want a warm, easy care jacket for casual or hiking. Big thumbs up for the lovely staff at REI in Henderson, Nevada! I wear this jacket outside on cool evenings. The fit is great, even for someone long in the arm or torso, I didn't have to go one size up to get a great fit. Love that the pockets zip although an inside zippered pocket would be nice. I also have a white one that has been washed several times and shows no sign of yellowing or pilling. The ibiza blue is even brighter, and in my opinion, prettier than shown on the web. More of a bright turquoise than a sky blue. Considering getting another one, I love this full zip style much better than the mossbud pullover. Northface quality is worth every penny! I purchased this jacket in the hot pink color for my daughter to wear around campus. We live in Memphis; she has been able to wear it most of the winter (she has only needed a heavier coat on a few occassions.) She loves the fit and color. The silky fleece has not matted, and it does not collect pet fur like the other micro fleece jackets do. It washes beautifully. I will probably purchase another color next fall! It costs more than the off-brands, but it is very much worth it, as it still looks brand new after months of wear! I tried this jacket on in the store. They didn't have the color I wanted so they ordered it for me. I was so excited to get it because it was so comfortable. I love TNF products and have only had one other jacket that left fuzzies. Fuzz was all over my seat belt in the car, which then got on my work uniform. As I sat there picking the fuzzies off, I suddenly realized I had bought this jacket about 3 years ago and had the same problem. I returned that one too. Even after washing it, it still sheds. On Christmas morning, my daughter opened her gift only to discover the sleeve wasn't fully sewn to the jacket. That created a huge hole in the shoulder area. We weren't about to try to machine or hand sew it to try to fix it ourselves. Back into the box and I promptly returned the item. Still waiting for some form of communication from you as to if you received it and when I may be credited for the defective merchandise. I'm still waiting to form my final official opinion. The jacket was furry and did not appear so online. Rain would make the fabric look terrible. The color I ordered was supposed to be a cream color, but the nature of the furry fabric just made the jacket appear dirty. The jacket had no lining and was very light. There are way cuter North Face jackets much more worth the hefty price tag. Had this jacket for a month. washed as instructed, the edging on the sleeve came unsewen. Had a neighbor sew it to get it back soon and not have to pay postage. I'm entirely conflicted on this jacket. I first purchased it a few months ago and adored how soft and cozy it was, and it's fairly warm for the weight. However, it shed on anything that caused friction-- seat belt, purse strap-- and also matted in these places fairly instantly. Like, within one or two wears. So I returned it. But I missed having around a soft, fuzzy, warm jacket, so when it went on sale I recently repurchased it. And... I'm still conflicted. It's basically unwearable in the car unless you have something over it due to the fleece pilling off on the seat belt in MASSIVE amounts. I'm not talking one little fuzzball, but an insane number. And then the matting. It can and will mat wherever there's friction. So far lightly going over the matted spots with a soft bristle brush has helped, but I worry that it's just going to fall apart in a rather short period of time. I have other fleece jackets and NONE of them have pilled/shed so soon and so badly. Am I going to keep it this time around? Probably, because I got it heavily on sale. But all the same it's aggravating to have a jacket that you pretty much have to walk on pin and needles with because it is unable to handle any type of friction. If you know that going in and can deal with it, go for it. But if this sort of thing is going to bother you, I'd skip the Osito. ok, i love the fact that its warm and comfortable and light to wear but i am extremely disappointed that it sheds badly.. i understand its fleece and some shedding is possible but If i would have known that it was going to shed as bad as it does i would not have purchased this jacket.. its bad for moms when i carry my little one her clothes and coats end up turning black due to the shedding of my jacket and my tops well thats another story.. i love my other northface coats but this one was definetly not a good investment for me..
Bought this as a Christmas gift for my wife. While she was very happy with the feel, size, and warm of the jacket we ended up returning it. It shed very badly when in contact with a seatbelt and left purple pills of fabric all along the seatbelt, even after washing. Also, the tabs to snap it into another jacket are a little annoying when wearing the jacket by itself. I bought this jacket for the spring,and fall cold weather. I love it and it is very warm and comfortable to wear. However, when I washed it it started shedding. The fleece also would stick to the seat belt in our car and transfer to other coats and sweaters. I am so disappointed because I really like it but not worth the hassle of having fuzz everywhere. Jacket was cute and really comfortable but the sleeves and body were way too short. I am 5'11'' and 135 lbs. I have another Northface zip up microfleece in size medium so ordered this one in Medium but the sleeves and body are way shorter! Had to return unfortunately. Was a pretty color too, I had ordered the Ion Blue.